I had a LEGAL abortion in 1968 at the age of 16, after I was raped. 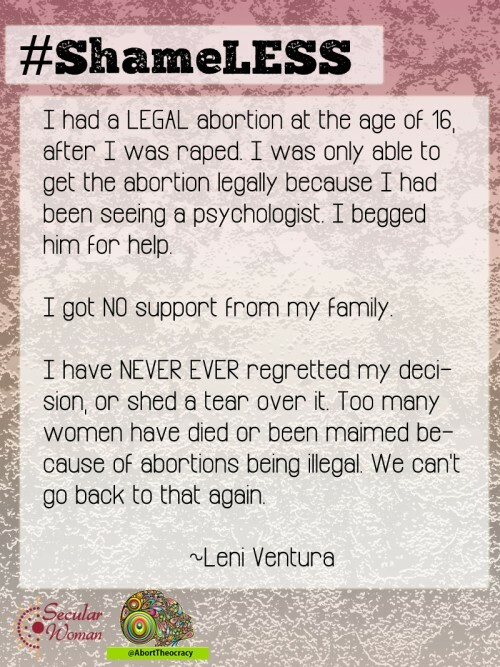 I was only able to get the abortion legally because I had been seeing a psychologist, and I begged him for help. I don’t know what kind of strings he had to pull, but I will be eternally grateful to him for his support. I got NO support from my family. My mother even called me a liar about being raped, although I had a witness. I also had several friends who obtained abortions; one of them going as far as Japan to obtain it. Others had to go out of state or to back-street abortionists. I have NEVER EVER regretted my decision, or shed a tear over it. Too many women have died or been physically maimed because of abortions being illegal. We can’t go back to that again.